A colour photograph of Whitby's original pump house. View showing the west side of the building. The Waterworks pump house was built in 1904 on the lakeshore between Whitby Harbour and Heydenshore Park. An additional pump house was built to the east of this building in 1959. 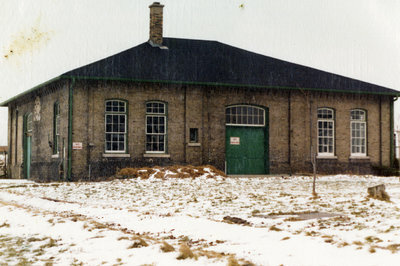 The original building ceased to be used when a third pump house was completed in 1978. Waterworks Pump House, 1977, Robert Kirk. Whitby Archives D2013_005_005.